Even when we have the best of intentions to eat well and only eat at meal times there are days when we’re going to feel hungry outside of normal meal times. For me this usually happens in the afternoon when I’m sitting at my desk or after dinner a couple of hours before bed. I’ve written about some of the issues of craving things that I’ve been dealing with lately but those have mostly settled down again. If we are wanting to be mindful about what we eat and why, snacking can be a big challenge to that. Once you begin snacking, it is very easy to just keep going. Mindfulness gets shown to the door and unceremoniously kicked to the curb. Then, once we’re done snacking, we feel a sense of loss or regret or anger or shame. We can beat ourselves up over why we gave in to a craving or why we didn’t resist more. It’s a vicious cycle and can easily lead us to feel like a failure. I used to loath myself every time I’d finish off an entire pint of Ben & Jerry’s ice cream in one sitting. That didn’t stop me from doing it though: it just made it worse. So, how do you snack mindfully without destroying your healthy lifestyle goals? What do you do when most snacks revolve around the holy trinity of salt, sugar and fat? Here are some things that I’ve learned and have worked for me. Find something healthy that you actually enjoy snacking on. For me this was baby carrots. I love the little things. They’re crunchy and healthy and satisfying. I also love to snack on fresh fruits or berries. You need to find whatever works for yourself as a snack food. Planning ahead for the times of craving or unexpected hunger really helps you get ahead of things before desire to eat even rears its ugly head. If you do snack, leave the bag alone! Don’t grab a container of anything and bring it with you. Measure out a few or a specific amount and put it in a small bowl or other container and limit your snacking to that amount. This way, if you do eat mindlessly, you’re still able to stop yourself from eating too much. This is a trick I used a few days ago when I absolutely couldn’t go without something sweet. I had grabbed a bag of Vanilla Wafer cookies and my wife gave me “the look” and reminded me of my rule. I grabbed 5 cookies, put them in a small bowl and put the bag back in the pantry. I got a little something sweet without destroying myself for the day. Don’t snack while doing something else. Keep snacking a separate activity so that it is easier for you to monitor what you’re doing. I spend a lot of time in front of a computer screen. It’s very easy to grab a snack and just eat while I work. I no longer allow myself to do this. If I have to snack, I do it in the employee kitchen/dining area that’s downstairs from my office. If I’m at home, I snack in a room that doesn’t have a computer or a TV in it. When you combine snacking with some other activity you lose your ability to eat mindfully. Don’t keep junk food in your home. This is a rule that I would like to follow more closely but the fact is that I’m not the only one in my house. My kids and my wife don’t have the same problems as I do and my will power is usually strong enough to resist grabbing the pretzels or cookies or chips or whatever is in the pantry. That’s why I have rule 2 above and it has served me well in the times when my willpower isn’t enough to keep me away from the junk food. If you do keep it out of your home, it is much harder to grab impulsively in the evenings. Don’t keep junk food at your desk/place of work. This is a rule that I do follow. I have a few packets of instant oatmeal here at my desk and I will also keep fresh fruit at my desk. This is what I eat if I’m at work and need to snack. Since I have food with me, I don’t feel tempted to pop coins into the vending machine in the employee dining area. If you do find that you have failed in your desires to be healthy and have downed a massive amount of junk food remember that it’s not the end of the world. You are not a failure and you have not failed yourself. Instead of judging yourself too harshly accept what has happened and ask yourself why you felt such an urge to snack the way that you did. There could be many reasons: stress, anxiety, worry, sleepiness, anger, feelings of worthlessness or any other of hundreds of triggers. Remember that “I don’t know” is a valid answer to this question. Don’t be upset if you ate mindlessly for no good reason at all. It’s OK. If you do know why you snacked the way you did, spend some time planning for how to handle the situation differently in the future. Each one of the reasons I listed above plus more that I didn’t have all been triggers for me to want to snack mindlessly. Sometimes I’ve resisted, other times I haven’t. Once something is done, it’s done. We can’t go back in time and change the past. We have to accept what has happened and move on with compassion for ourselves. Failure is a part of this journey. We will not be successful all day, every day. We will eat mindlessly, we will eat junk foods, we will lose our focus. Knowing how you will react to those times before they happen is a critical component of making the long-term changes that will create a healthy lifestyle.If you haven’t already done so, make a failure plan. Know what to do when things go wrong. It makes navigating the emotions and reactions to those failures much easier. It’s the difference between being lost with a map and a compass or just being lost in the woods. Use your failures to learn. Use them as opportunities to learn self-forgiveness and compassion. Use them as you would any positive experience or lesson. This is what I have done and this is why I am still losing weight even after seeing my weight creeped up a few pounds because I was struggling. Don’t lose hope and you will lose weight. 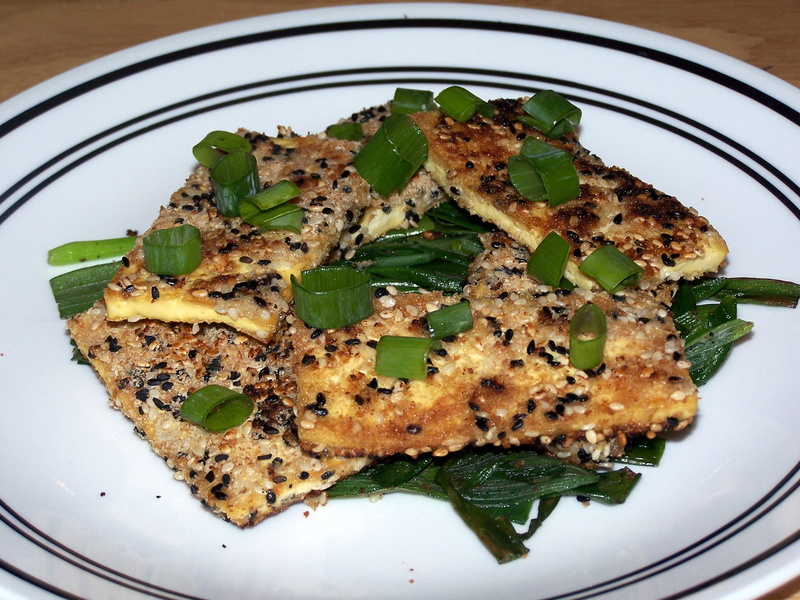 This evening I made the sesame crusted tofu that I had found the recipe for earlier this week. It was as good as I thought it would be. 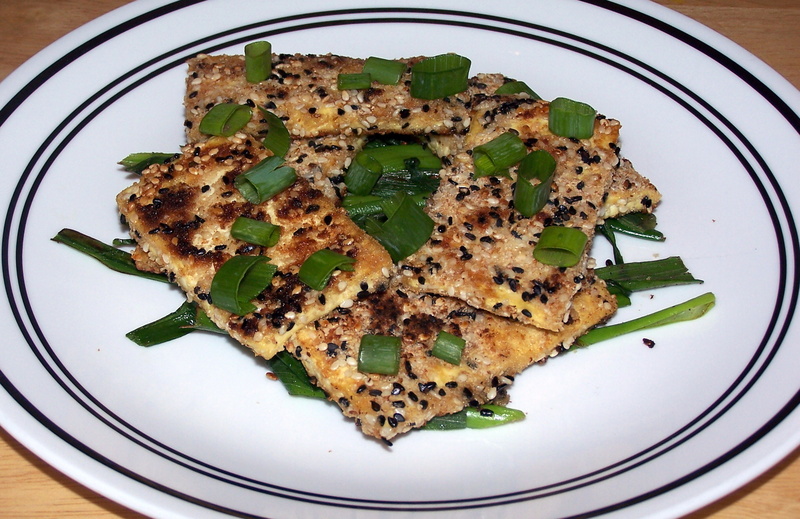 The tofu was crispy and the sesame seeds were the perfect touch to give the tofu some really nice flavor. The ultimate test of just how good it was came when my wife told me that it smelled really good and she wanted to try a bite. I couldn’t believe it. She actually wanted to try tofu! My wife usually doesn’t want to get anywhere near tofu and she’s never tried any of the tofu dishes that I have made. Even better than her wanting to try it was when she told me she liked it and would like to try my BBQ tofu the next time I make it. I think that was one of the happiest moments I’ve had since I started to make changes in the foods that I cook so that I can eat healthier. I know when I make and enjoy something good for myself. It’s really nice to make something and have someone else tell me it’s good. I’ve had to learn to use so many new ingredients and new cooking methods and it’s nice to get positive feedback from others who enjoy my food. Not only does it give my ego a bit of a boost (though I am making a point not to let it get out of control) but it makes me happy that I’m able to introduce someone to a new ingredient or show them that there is a “healthy” food that they really can enjoy. I used to like cooking for others because it meant doing something nice for them. Now, in addition to that, I’m helping them discover ways that they can make positive changes for themselves. As people discover that they can enjoy eating healthy, it becomes easier for them to envision making the changes that they want to but haven’t been able to. This is a key to making long term changes. When I felt trapped in my own body and was hopeless to change, I was unable to think about eating healthy. Even when I decided to try to lose the weight and change my lifestyle I didn’t know if I’d be able to do it. Food is such an integral part of who we are and it’s something with deep seated cultural and emotional components. To change what we eat is to, sometimes, change who we are. I didn’t want to be some hippy wimpy vegetarian who ran from the sight of a medium-rare steak. I couldn’t imagine myself being a skinny vegetarian who could get blown over by a strong gust of wind. My mental image of eating healthy was as out of synch with reality as my weight was out of control. As I began to learn about new recipes and realize that I could make some really good foods that were entirely meat free I felt empowered to change. There was a lot of freedom that came with that realization and now I hope to be able to use my skills to help others feel the same. To cook healthy and to provide hope to others wanting to eat healthy is a wonderful thing.